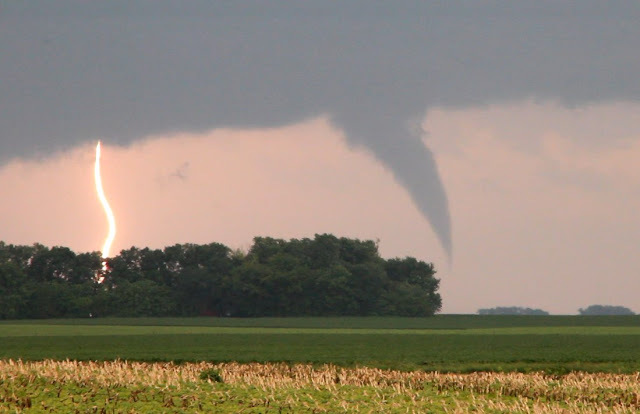 Weather Studios Blog: Day 14 - Tornado! Walmart carpark. Again. Well as we hadn't finished driving till gone midnight, there seemed little point in getting a hotel for the few amount of hours we'd actually be using it for. The previous night we'd had our sights set on Brookings on the western edge of South Dakota as a staging post for today and looking at the models in the morning this still seemed a viable bet. It was only 90 miles away so we headed there and did our statutory 'wait in the park until something started to happen'. Everyone on the forums was pretty excited about today. It looked a good set up. Plenty of moisture, scorching temperatures and enough wind shear at the required levels conducive for tornadoes. The main areas of interest were slightly more to our east stretching down from Minnesota through Iowa. After a bite in the park we headed across the state border into southern Minnesota. Again, updraghts were notably strong, a good sign. But it seemed a line was already starting to form. Cells were springing up but merging into each other in no time. We had to have a think. Yesterday we were caught out the wrong side of the line. It wasn't so simple today though because about 50 miles behind us another line was starting to form, so we may have been the wrong side of one, but we were the right side of the other. Hmm. Another thing to bear in mind about these linear formations in that it's often the case that the southern most part of the line is where the 'tail end charlies' can be found - tornadoes that form from extreme rotation at the end of a line of storms and we were positioned quite nicely behind the end of the initial line. We decided to not change our position too drastically but just tweak to ensure we kept close behind the end of the first line and in front of the cells forming to our south west. As anticipated the tail started turning! We hacked it east along the highway to get a bit closer, then off the highway and onto some smaller roads. Good navigation skills needed here and a feel for exactly where the tornado would be most likely. Time for eyes now. Rotation was apparent and in the distance we could see a funnel starting to form. It got lower and lower and the dust started swirling from the ground upwards as we'd seen happen a few days prior to this. Then touchdown. It was on the ground. Our first nader. We rushed to grab cameras, memory cards, tripods etc. Nothing was where it was meant to be! We managed to get a few blurry photos but it was hard to not just stand there and watch it. It lifted slightly. We saw this as our opportunity to get a bit closer. We parked up and down it went again. This time Tim caught it on video and we got a few more pics. A full on stovepipe torndo. The distance allowed it to be viewed as a graceful, magic work of nature. It was only when we drove through its path a little later that we actually saw the devastation left in its wake. After it lifted for the second time, we drove on in an attempt to follow the cell in case it touched down again. The damage it had left was all around. In the fields either side of us there were lines of trees shredded of all leaves, bent over from the sustained winds but now left permanently in this position. The road then took us into a village called Keister, a small community with maybe 50 or so inhabitants. It was obvious the tornado's path had been very close to these people's homes. We had to weave our way up their main street to avoid the branches and debris all over the ground. Some trees had been blown over onto people's cars. Everyone was standing on the road outside their houses assessing the extent of the damage that had just been caused within the last 20 minutes. As we passed through the area we both experienced the overwhelming sobering feeling that is often described by chasers in such scenarios. What is seen in beautiful form from a distance can often have such devastating effects when tracking too close to these populated areas. Luckily no-one was hurt and our assistance wasn't needed so we pushed on. We were still on fairly small roads at this point; going was slow and we were both very aware of the potentially severe cells still behind us. But it wasn't so easy. The tornadoes that had torn through the area had left power lines blocking roads and we needed to think quick and smart to get ourselves to safety. We made it to the highway which is always a comfort, but looking at the radar we weren't out of it yet. In a mysterious twist of fate a large part of the linear formations from earlier had started to break apart and close in on us. 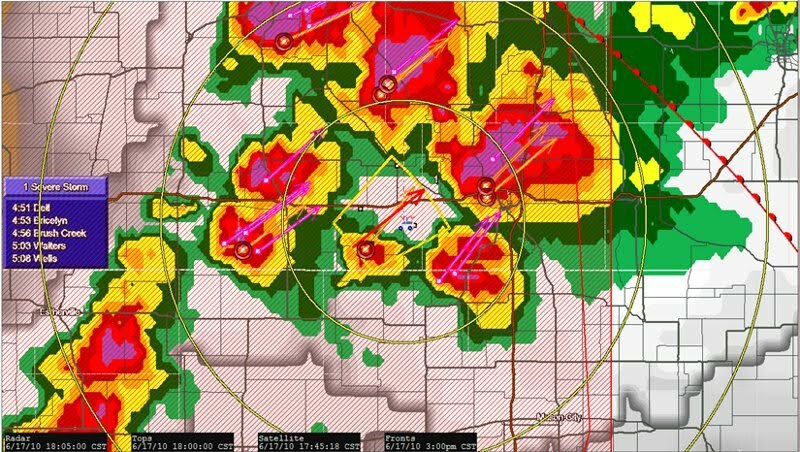 We were surrounded by tornadic supercells. (Our GPS tracker is represented by the little white van in the middle of everything! )Our only option at this point was to head west along the highway and cut through the cluster to our south. The plan worked and once out of it we were rewarded with another near touchdown from a cell to our west. We now started to relax. We were out of the cluster and could sit back and revel in the glory of our first tornado. We pushed on south as we were aware the tail end of the second line was still linear and approaching from our west and tornado warned. It was dark and it's no fun meeting an unexpected rain wrapped tornado on the road so we had the choice of finding a motel and letting it pass over or driving south to undercut it. We stopped at a roadside gas station to fuel up and make a decision. Tim was inside paying when all of a sudden I looked up to my right and above the gas station was a monster shelf cloud, very much like the shelf clouds of earlier photos. The line was upon us already. There was no one else around. It shouldn't have reached us this quick. It was really moving at quite a pace. I saw Tim inside chatting to the gas station attendant. I jumped out of the car and ran to the window waving my arms around and pointing to behind the gas station. When outside, Tim looked around and finally saw what I was seeing. We realised we needed to go, and right now. We screeched off. The overhanging blackness of the cloud was approaching us diagonally and the winds were pushing the car from side to side on the road. It was undrivable. We had left it too late. We had to turn around, back into it (which seemed crazy) but we had to get back to the gas station. We pulled up and ran inside for shelter. We made friends with the attendant lady, who thought it very amusing to have two Brits who claimed they were storm chasers hiding out in her gas station. I guess it was pretty funny. But it was also scary enough that I had to grab a beer from the fridge to calm the nerves a bit whilst we waited for it to pass.